However, there are some downsides that mean you should also consider some rivals like the Moto G7 Plus and Honor Play. Performance isn't amazing, it's got a Micro-USB port and mediocre battery life. [Review] Galaxy A7 (2018): vale a pena ter três câmeras? A maioria das análises publicadas na época do lançamento do Galaxy A7 o comparavam os modelos topo de linha que haviam sido lançados no ano anterior – e com razão, já que o celular chegou custando R$ 2.199 e por algumas centenas de reais a mais você conseguiria comprar um Galaxy S8, por exemplo. To be fair, it’s not the most optimised triple-camera system on the market, but it doesn’t mean that the camera is all that bad. To reiterate my points; the Galaxy A7 is no slouch and is still capable of taking some really great shots in the day. Love it or leave it, the phone is also currently the only mid-range smartphone in the market to feature a triple-camera main array and a sleek look. And it only costs RM1099. If you’re looking for a budget device with gorgeous display, it’s hard to go wrong with the A7. Software is still something of a mixed bag compared to stock Android, and it would have been nice to see support for USB-C or wireless charging, but the triple-lens camera and respectable price point make it hard to turn down. With all the pros and cons mentioned above, it's clear that the Galaxy A7 (2018) is made for users with different needs, particularly those who love going to the outdoors and taking landscape photography with the ultra wide-angle lens. The side-mounted fingerprint scanner is a bonus and entertainment for both games and video playback is fairly good as well. Not to mention, the design is very well done and this will surely attract young people. The rate of improvement at the high-end seems to be slowing, while in the mid-range the pace is picking up. The result is a breed of competitively priced devices which look, feel and perform like flagship devices of only a year or two ago. The Samsung Galaxy A7 (2018) is a perfect example! A pleasant mid-range Android, if not the very best choice for enthusiasts on a budget. The Samsung Galaxy A7 is, for the most part, a great mid-range phone. It delivers a punchy screen for the price and a solid user experience, while the camera system is really versatile. It also has great battery life and plenty of storage. Having said that, it does feel a touch hollow, with the plastic frame paling, micro USB port and lack of fast charging being disappointing. If none of that phases you though, you can pick up the Galaxy A7 with confidence. In all honesty, this year’s Galaxy A7 is actually a decent phone, but there’s nothing really special about it. The triple camera feature is nice and all, but that aside, there’s nothing really that stands out. At Php17,990, you’d find yourself in a pool of midrangers that are cheaper and comes in with new features. However, if you’re a fan of the Galaxy A-series, then it won’t harm if you’re considering getting this phone. It’s still a good daily driver. You’re still getting Samsung’s premium build, a good set of cameras, and vibrant display. The Samsung Galaxy A7 (2018) is for someone looking to maximise the smartphone imaging capabilties. In its price range, there are phones that have excellent primary camera. Spend a little more and the Asus Zenfone 5z offers a good enough wide-angle camera, but it's can't take good portrait shots. The Galaxy A7 (2018), on the other hand, seems to offer all three options to the user. You have a 24MP primary camera that works pretty good in the day time and decently enough in low-light. The wide-angle, even though it has a fixed focus, is good enough for the sweeping wide shots in the day. The portrait mode on the phone is also quite consistent and can take portraits that looks much more natural than what the Poco F1 can do. That's what the Galaxy A7 (2018) brings to the table. It offers choice where others don't. Otherwise, it's not as great a performer, neither does it have most durable design and it certainly doesn't have the longest battery life in its price range. In the end, the Galaxy A7 (2018) has a lot going for it, and we're talking smartphone pillars here - display, battery and camera. However, it's handicapped in key areas that make it hard to wholeheartedly recommend. Especially when the pillars above are covered similarly well by the competition. Having a triple rear camera set up at starting price of Rs 2 .. Overall, the Galaxy A7 (2018) is a decent mid-range smartphone at a starting price of Rs. 23990. It has a glass back the gives a premium look, triple rear cameras, including a wide-angle lens, Full HD+ AMOLED screen and offers a good battery life as well. However, the SoC is not the best for gaming and the phone has a micro USB port without fast charging. It is available exclusively from Flipkart. To summarize, here are the pros and cons of the smartphone. 70% Samsung Galaxy A7 review: Triple cameras are here, but could they be better? But I do feel the camera could have been better, especially in the low-light department. I expected a bit more wow considering this is Samsung’s first triple camera phone. Those looking for a good camera phone in Rs 25,000 price range can certainly consider the Galaxy A7. But those who want more power in their phones, the A7 might not always fulfil that consideration. Don’t get us wrong: it’s a phone that has that glass look and style that comes with it, and it handles basic tasks mostly okay, plus it has a beautiful Super AMOLED screen, but for demanding users its performance is lacking, its camera is downright disappointing, the fingerprint scanner is slow and in a sloppy place, you have the ancient microUSB, there’s no gesture navigation and overall this phone just lacks excitement and vigor! And that’s just unforgivable at the price that Samsung is asking for it. Samsung Galaxy A7 (2018) Review: Mid-range Comeback? Samsung’s Galaxy A7 (2018) definitely has quite a few things going for it. The new triple camera setup works as advertised, giving it quite a bit of flexibility for a mid-range phone when it comes to taking photos. The Galaxy A7 is priced starting at Rs 23,990 for the base variant, an amount that goes up to Rs 29,990 for the variant with 6 GB RAM and 128 GB. That is quite a premium to pay for just an additional 2 GB of RAM and more storage considering you already do have an option of expanding storage. Samsung may be trying hard to find its feet in a segment which they’ve ignored for too long, but unless they accept that a triple camera setup doesn’t cut it any longer, you might see it come up with more such phones in the future. We have already seen a 4-camera sporting Samsung A9 launch after all. There is no denying that a majority of what makes the Galaxy A7 attractive is its triple camera setup. Take that out and you have a common Galaxy J-series phone masquerading as an A-series device. The design is quite attractive and something you would appreciate for days after buying. The hardware, especially the Exynos chipset leaves you wanting more in a segment that is seeing some pretty crazy offerings by brands like Pocophone, Vivo, Asus and HMD/Nokia. The Galaxy A7 (2018) is the first Galaxy smartphone with a triple camera setup, and the different sensors do help you to get better shots in different situations. Despite the comparatively small 3300mAh battery, this phone manages to deliver good battery life thanks to its efficient processor. The glass back gives it a premium feel. We aren’t a hundred percent convinced about the side-mounted fingerprint scanner, as it wasn’t convenient when using the phone in the left hand. The Galaxy A7 (2018) is priced at Php 17,990, which places it at the same price band as offerings from its Chinese rivals. Will Samsung’s new triple-camera mid-range phone be the start of a new era for the company? Time will tell. In this dual-camera smartphones war, Samsung has done something remarkable by adding a third camera onboard to its newly launched Galaxy A7 (2018). Perhaps, this is the first smartphone from Samsung to feature triple cameras. In addition to that, it comes with a side mounted fingerprint scanner. Take a look at our hands-on with the Samsung Galaxy A7 (2018). With a promising set of cameras and newly positioned fingerprint scanner, this smartphone looks like it could be a serious contender in its price segment. Do stay tuned to Gadgets 360 for our extensive review of Samsung Galaxy A7 (2018), coming up soon, in which we will thoroughly test its cameras, build quality, display, performance, software, and battery life. Samsung Galaxy A7 2018 – Everything You Need To Know! 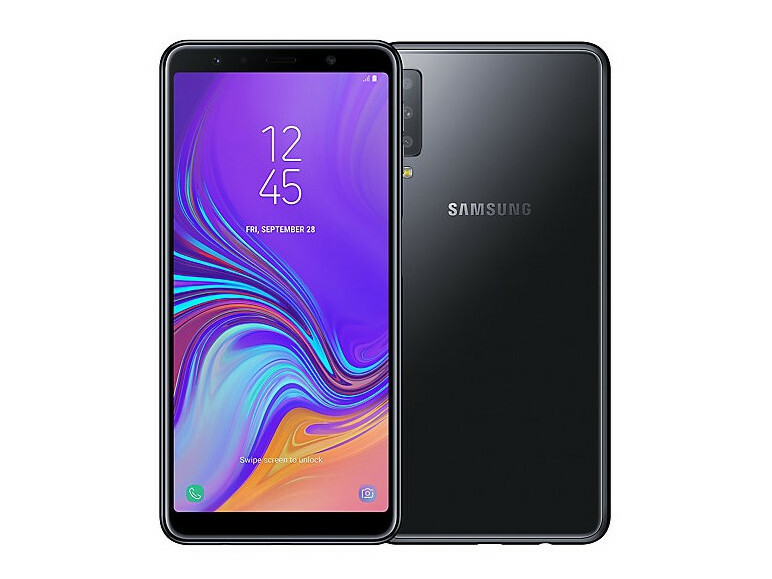 The Samsung Galaxy A7 2018 has a large 6.0-inch Super AMOLED display with a Full HD+ resolution of 1080 x 2220 pixels. This is an Infinity Display, which means it has very thin bezels, delivering a more immersive viewing experience. Especially with its support. The Galaxy A7 is the first handset as part of the new strategy. The A7 is Samsung’s first device with a triple camera and highlights how it’s bringing new technology to lower-priced smartphones, even before its flagship handsets. 80% Samsung Galaxy A7 2018 Triple-Kamera ... und was noch? Samsung Galaxy A7 2018 Traut Euch endlich! 80% Samsung Galaxy A7 (2018) recensione: tripla fotocamera e... c'e altro? 70% Test du Samsung Galaxy A7 : se démarquer par la photo grand angle? 80% Test du Samsung Galaxy A7 : triple appareil photo... et quoi d'autre ? Обзор Samsung Galaxy A7 2018: каким получился первый смартфон Samsung с тремя основными камерами? Đánh giá hiệu năng Galaxy A7 (2018): Exynos 7885 gây bất ngờ! 90% RECENZIA Samsung Galaxy A7 (2018): Aké výhody prinášajú 3 fotoaparáty? ARM Mali-G71 MP2: » Further information can be found in our Comparison of Mobile Graphics Cards and the corresponding Benchmark List.